Shirt - The official tan uniform shirt is available with long or short sleeves and has button-flap pockets. Pants - The official green shorts, long pants, skorts, and roll up pants. Socks - Official green socks are available in three lengths: ankle, crew, and knee. Hat - Official green hat with Webelos plaid front and Webelos emblem. Neckerchief - Webelos plaid triangular neckerchief with Webelos logo. Official BSA neckerchiefs are the only neckerchiefs that are part of the uniform. Neckerchief slide - Official gold-tone metal slide with Webelos emblem. Cub Scouts may wear handmade neckerchief slides. 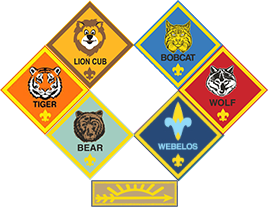 Webelos Colors - The Webelos Colors is an optional uniform piece that is worn on the right sleeve to display the Webelos Adventure Pins that have been earned. If the Webelos Colors are not used, Webelos Adventure Pins may be worn on the Webelos hat.